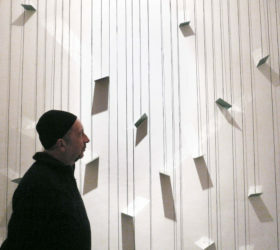 As part of his exhibition Letters to Hassi Labiad and other messages Josep Ginestar presents an installation of letters-mirrors, addressed to the village of Hassi Labiad, near Merzouga. The project is also constituted from tableaus, made of golden leaves on wood, of the sand from the Sahara, of imprints, and three sets of drawings. Based on bi-dimensional interventions and installations, the artwork of Josep Ginestar is characterized by the choice of materials of “Franciscan” poverty, humble, linked to the poetic sonority: golden leaves, sand, pebbles, canvases, mirrors, glasses. His works are profoundly marked by the spiritual research and by Ginestar’s own journey, which led him to pick interest in the desert. Silence and void emanate from his artworks. Josep Ginestar creates artistic installations related to spaces where he lived. He utilizes the soil that surrounds him as the primary material. 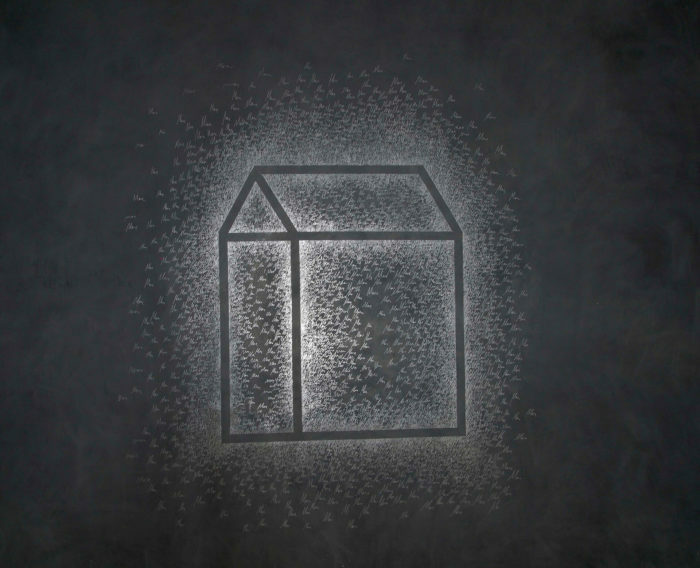 While living in Morocco and Spain, the artist’s projects are influenced by the Land Art movement, the work of Joseph Beuys and Arabic and Andalusian poems.